Things Cooks Love: Sea Bass Poached in Orange, Basil, and Wine with Citrus and Herb Sauce - From Things Cooks Love: Implements. Ingredients. Recipes. 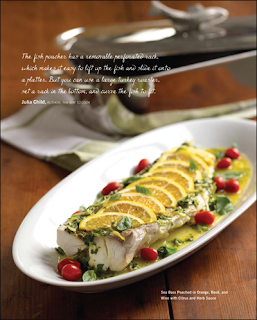 Sea Bass Poached in Orange, Basil, and Wine with Citrus and Herb Sauce - From Things Cooks Love: Implements. Ingredients. Recipes. The traditional liquid for poaching fish is called court bouillon. This is a broth made from cooking vegetables and herbs in water and wine. This recipe deviates from the classic by using orange juice, white wine, and basil. Prepare it ahead of time so it has time to cool to room temperature before you poach the fish. (Used poaching liquid can be strained and frozen for 1 to 2 months for a second use.) You’ll need enough liquid to cover the fish. Remember the fish should be slowly cooked in simmering, never boiling, liquid. Sea bass, a fine-fleshed fish with a sweet, mild flavor, is a good choice for poaching, but almost any firm-fleshed fish can be used. 1. Make the poaching liquid: In a large saucepan, combine the water, wine, orange juice, orange zest, basil, parsley, onion, bay leaf, garlic, salt, and pepper, and bring to a boil over high heat. Adjust the heat to a gentle boil and cook, uncovered, for 15 minutes. Let cool to lukewarm. Strain through a fine-mesh strainer or chinois. Taste and adjust the seasoning with salt. 2. To ensure even cooking, the fish and poaching liquid should be almost the same temperature. To achieve this, remove the fish from the refrigerator about 1 hour prior to cooking. 3. Run your hand over the surface of the fish fillet to locate the pin bones and determine the direction of their growth. Use the tip of fish bone tweezers or pliers to pinch the top of the pin bone and slowly tug at the same angle as the bone. If the bone breaks off, you are pulling in the opposite direction of growth, so you must reverse direction. 4. Remove the rack from a fish poacher 18 inches long and 7 inches wide. Lightly oil the rack with the olive oil. Place the fish, skin side down, on the rack. Lower the rack into the empty fish poacher. Gently pour the roomtemperature poaching liquid into the pan. 5. Set the pan over two burners and turn them on to medium heat. Cover and heat the liquid, checking under the cover frequently, until a bubble or two comes to the surface. (This will take about 15 minutes.) Adjust the heat to medium-low, re-cover, and cook, without boiling, for 15 to 18 minutes, until the tip of a small knife inserted into the thickest part of the fillet finds no resistance, or the internal temperature registers 130° to 140°F on an instant-read thermometer. 6. While the fish is poaching, make the sauce: Place the orange juice in a small saucepan and bring to a boil over high heat. Adjust the heat to medium and boil gently for 5 minutes, or until the juice is reduced by half. Pour into a bowl and let cool to lukewarm. 7. Gradually whisk the olive oil into the orange juice until blended. Add the lemon juice, green onions, basil, parsley, oregano, orange zest, salt, and a grinding of pepper. Stir to blend and set aside. 8. When the fish is cooked, turn off the heat. Place next to the stove a rimmed sheet pan large enough to accommodate the poaching rack. Remove the cover of the fish poacher. With your fingers protected with oven mitts, carefully lift the rack from the fish poacher and place it on the sheet pan. (Alternatively, you can place the poaching rack with the fish in the sink.) Let the fish sit on the rack for 10 minutes. Loosen the fish by running a large, flat spatula between the fish and the rack. Then, use 2 long, flat spatulas, or 1 long spatula and 1 shorter one, to carefully lift the fish off the rack and place it on an oval platter. 9. Stir the sauce and ladle half of it over the fish. Arrange the orange slices on the surface of the fish in a slightly overlapping pattern to simulate fish scales. Garnish the platter with the basil sprigs and cherry tomatoes. Serve the fish warm, and pass the remaining sauce at the table. Or, cover the fish with plastic wrap and chill until ready to serve. This looks great! I just made sea bass as well (over at Kitchen Confit). I have read your post, it was very helpful to me. Thank you for share the post.